The trulli are drystone dwellings with conical roofs. 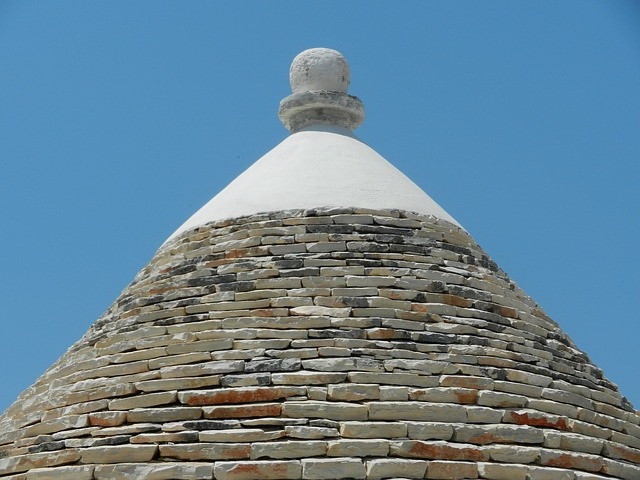 A typical trullo has thick walls and is either round-shaped or square. In Alberobello most of the trulli are square-shaped. Usually a trullo is a single-storey small building. It is technically hard to construct a multi-storey trullo. There are only few two-storey trulli in the town. The second floor in these constructions is made of wood, but this happens rarely. It is easier and more practical to construct several small trulli than a big one. That is why big families in Alberobello were living not in one single trullo, but rather in trulli groups. Big families could have a group of dozen trulli constructed next to each other. The interior of a trulli is mainly made from wood. The roofs are not painted, but the walls are traditionally painted white. Trullo is a rural building type. It was meant to serve as field shelters and storehouses. Alberobello is a unique case where they became the main lodgment for the local population. The history behind Alberobello is of course connected with money and cunning Italian aristocrats. When in the 14th century the previously uninhibited area became under the control of the Count of Conversano, he and his successors decided not to construct permanent dwellings here for their peasants, as far as the taxes for the lands with no permanent settlements were lower, than those with officially recognized towns. In order to pay small taxes Alberobello was supposed to be classified as an uninhabited area. For this reason trulli in Alberobello were being constructed in a specific way. Trulli were being constructed from roughly worked limestone, because this material could be easily dismantled and later reused for reconstruction of the dwellings. Because of the jiggery-pokery of their landlord the inhabitants of Alberobello have already been living in trulli for several centuries. Up to the mid 17th century there were only several dozen trulli in the area, but during the following century the population of the town rapidly increased. By the end of the 18th century the town had a population of 3,500 inhabitants. In 1797 Alberobello was finally granted a status of a town, but up to that date its population was living in trulli, which could be easily and quickly disassembled if it was necessary. Today, AlberobelIo is one of the best preserved historical urban areas of this type in Europe. 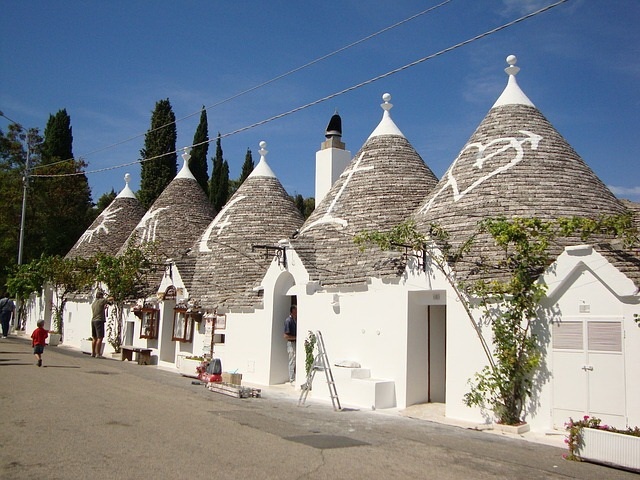 The historical value of the town increases because the Alberobello trulli are still serving as houses for the local population.